Easily forgotten by the Packers recent success against its arch-rival Bears is a fact that most Cheese-heads would choose to ignore: The most historic rivalry in football is currently being won by the team from Illinois 92 - 88, with six ties. Mention that fact in Packer country, and you are bound to hear cries of protest. Some will proclaim that decades back there were “bad calls and crooked games” that went the Bear’s way. Others will point to Green Bay's 13 titles to the Bears nine as a more significant measure of success. Some are happy to remain blissfully ignorant of those decades preceding this current run of Packers versus Bears dominance. But, that past does remain. It’s recorded in lore and cold, hard statistics. Ninety-years have passed since 7,000 fans gathered on a blustery November day in 1921 to watch the first-ever meeting between the Chicago Staleys and the Green Bay Packers. After their inaugural game at Cubs Park, the Packers-Bears rivalry would be a one-sided affair for 40 years. Chicago came away victorious against Green Bay 49 times between 1921 and 1959. The Packers managed just 26 wins in that same time period. The years during and following World War II were especially unkind to Green Bay. Despite increasing attendance and a new stadium, as well as a barrage of coaching changes, the Packers would win just nine games against the bears through the late 50s. Dubbed the Wilderness era, that period hit rock bottom with their dismal one-win season in 1958. Thankfully, that remains to be their worst single-season record in franchise history. Green Bay's struggles against the Bears didn't make for unexciting football, however. Experts and fans alike agree that some of the more famous antics in this rivalry’s adolescence serve as evolutionary markers to the birth and development of the game as we know it today. The longest shut-out streak in the rivalry’s history took place during those early years, as the Packers held the Bears scoreless for five consecutive games starting in late 1928. 1924 – Frank Hanny (Chicago) and Walter Voss (Green Bay) are the first professional football players to be ejected for fighting during an NFL game. 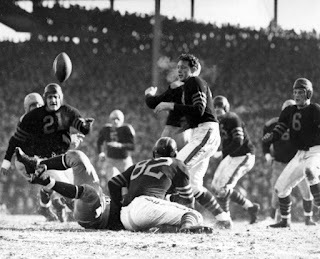 1930 – The Bears score their first points against the Packers in nearly two years on November 9th. They wouldn't win another game against the Packers until December 7th of that year. 1941 – The pair played their first-ever playoff game. Chicago scored 33 points to the Packers 14, going on to win their fourth title against the New York Giants. It would be another 69 years before both teams would meet again the in the postseason. Surprisingly, the Bears and the Packers have made the playoffs together just four times since the format was introduced in 1933. In 1994 and 2001, both teams were eliminated in the second round of the postseason. Not until 2010 did the pair play each other for a chance at the Super Bowl, a game that most call the most important meeting in the history of the rivalry. Before advancing independently to the NFC Championship game that year, Green Bay and Chicago met for the final regular season game of 2010. The Bears came into the match-up content with a secured first-round bye in the playoffs, though the Packers needed a win to clinch a wild-card spot. In an impressive defensive battle, Green Bay and Chicago put-up just 13 points combined. The Packers would edge-out the Bears with a touchdown, and a 10-to-3. Wins against Philadelphia, Atlanta, and Seattle would pit the pair against each other just weeks later. On January 23rd, 2011, Green Bay defeated the Bears at Soldier Field for the right to face Pittsburgh in Super Bowl XLV. The Packers won the game, their fifth Super Bowl championship, and their 13th overall NFL title. The two wins over Chicago that vaulted Green Bay to the 2010 title were part of the 30-plus victories the team has had over their southern neighbor since 1990. The Bears began that decade with five straight wins against the Packers, completing a 15-to-2 run that had begun in 1985. Green Bay would reverse the trend less than two years later. The Packers have enjoyed their most successful time in this hard fought rivalry since then. Not since Vince Lombardi's team took the field in the 1960s have the Packers had as many wins against Chicago as they have had in the past 20 years. Back then, the Bears fell victim (along with the rest of the league,) to a Packers squad led by Bart Starr and Willie Davis. The Packers went on to take five league titles in seven years. 15 wins between 1960 and 1969 stand as the most in a single decade for the Packers against their rival. Fast forward to today, and we’re looking at 31 victories since 1990, including six in the past three years. The hot streak has many fans hoping that very soon the Bears will be chasing the Packers record for most wins in this storied rivalry.